A partnership involving a state environmental agency, a shipping line, several universities and federal infrastructure grants has developed sustained environmental observations of Port Phillip Bay and Bass Strait, in Southern Australia. The Spirit of Tasmania 1 traverses daily across Bass Strait between Devonport and Port Melbourne. EPA Victoria have instrumented the vessel with autonomous water quality sensors since 2008, and contributed the data to the Ships of Opportunity facility within the national Integrated Marine Observing System. The information has provided a high resolution window into the dynamics of Bass Strait and the adjoining Port Phillip Bay and Mersey Estuary. The data has been used to inform environmental managers and port authorities, aid fisheries research, integrate with numerical models, and investigate climate change studies. The data has highlighted Port Phillip Bay as a significantly climate modified marine system where reduced coastal discharges and higher evaporation caused elevated salinities 1.5psu higher than the adjoining ocean. 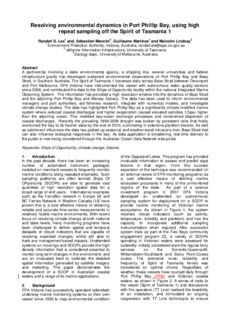 This modified bay-ocean exchange processes and constrained dispersion of coastal discharges. Recently the prevailing 1998-2009 drought was broken by persistent rains that finally overturned the bay to its fresher state by the end of 2010, culminating in extensive plankton blooms. As well as catchment influences the data has picked up seasonal and weather-band intrusions from Bass Strait that can also influence biological responses in the bay. As data application is broadening, real-time delivery to the public is now being considered through the Australian Ocean Data Network web portal.